About a year ago I posted about a wedding at which the bridegroom dropped dead of a heart attack right after saying "I do." I thought that had to qualify as one of the worst weddings ever, but this one is pretty bad also. As reported in the Chicago Tribune - Sep 21, 1907. The 2013 contest happens this weekend. I first encountered the whisper community a while back when I did a search on youtube for "Elephants on Acid" (title of one of my books) and came across videos of people whispering stories from the book. Here 'WhisperHub' whispers 'The Tickle Experiment'. 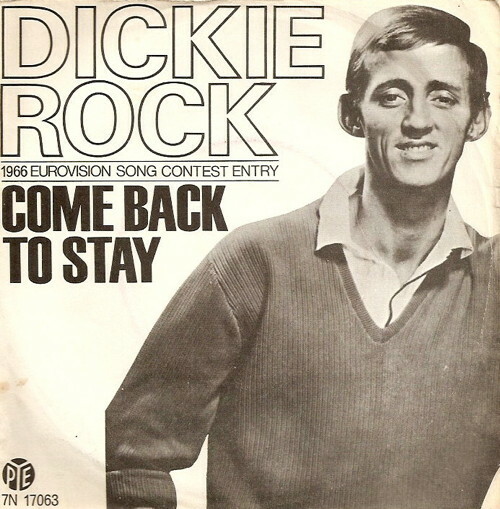 In 1966, he sang for Ireland in the 1966 Eurovision Song Contest with the song, "Come Back to Stay". He entered as a solo artist and finished fourth in the Contest. This song also became a number one hit in Ireland. Rock was the subject of a well-known Irish catchphrase—"spit on me Dickie", the origin of this being that rebellious young women in the 1960s wanted to be covered in his saliva in a manner similar to American women idolising the hips of Elvis. The phrase took off in Belfast in the 1960s and spread all over Ireland. So based on what Dr. Griffiths says, perhaps the desire of young women for Dickie to spit on them was related to their desire for him to ejaculate on them. It would make sense. Especially with a name like Dickie! This Friday sees the world premier of a new classical composition by popular modern composer Anna Meredith. However this is a score with a difference as Anna, in collaboration with top British beatboxer Schlomo (it's his real name), has incorporated 5 of the performance artists into her latest piece, Concerto for Beatboxer and Orchestra, playing at London Southbank Centre. The first problem facing the odd-couple duo was how exactly to score a beatbox performance as the vocal styling had grown from its hip-hop roots entirely by 'word of mouth' and has no formal notation. Undeterred Meredith and Schlomo have spent a year constructing their own, which they hope will gain wider adoption when the entire score of the new work is made available online for free following the first performance (FT). And Schlomo's beatbox talents can be checked out courtesy of the BBC's Jules Holland Show.